Maine Peoples Alliance. 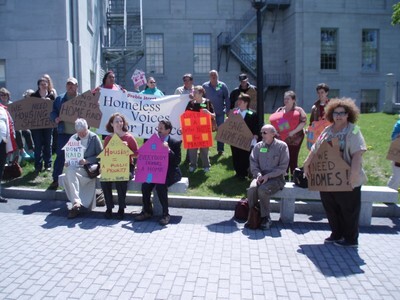 HOME Fund day at the capitol in 2007 as housing advocates press for full funding of the state housing trust fund. The Housing Trust Fund Project, created in 1986, is an initiative of the Center for Community Change. The Project operates as a clearinghouse of information on housing trust funds throughout the country, and provides technical assistance to organizations and agencies working to create or implement these funds. Since the Project’s inception, housing trust funds have become one of the leading vehicles for addressing critical housing needs in this country. Housing trust funds have demonstrated their ability to provide flexible funding for the preservation and development of affordable housing, as well as the ability to thrive throughout economic hardships and tough political climates. Local jurisdictions increasingly turn to housing trust funds as a key tool to meet their housing needs. The Housing Trust Fund Project is the nation’s only comprehensive source of information and technical assistance on these funds. We have developed a highly successful program to assist housing trust fund efforts in vastly different political and economic climates, and provide assistance to these multi-year campaigns until they succeed in creating new housing trust funds. We work with individual organizations, as well as coalitions, to enable everyone to understand all components of a housing trust fund and to ensure it is designed to be effective. We provide technical assistance throughout the campaign to ensure success at every step in winning passage of the housing trust fund.